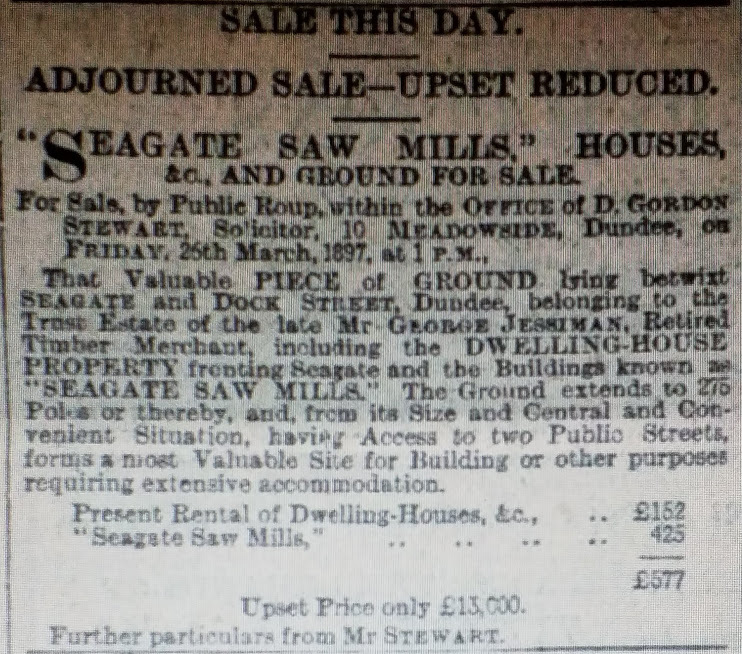 George owned a wood merchant's business at Seagate, Dundee from 1830 until 1880. At the time of his death in 1896, aged 85, he was living at "Rosebank" Broughty Ferry. He was successful and highly regarded. He was buried in the Constitution Road cemetery. Janet Jessiman (No, this is not a typo, her MS was also Jessiman). She was a third cousin to George. A committed supporter of the Young Women's Christian Association, his daughter Mary Ann having worked tirelessly in the organisation, and risen to be its President. George Forsyth Jessiman, born 1813, was the only child of Thomas Jessamine (sic) and his wife Helen Drummond. Thomas was described as a “baker” in Leuchars, Fife, but the same year as George’s birth sees him move to Dundee and start a timber business. When George was 17, his father died, and George carried on his father’s business. Janet always known as Jessie born 2nd August 1841; died 18th May 1880. She had married Charles Wilson (corn merchant) on 19th March 1867 and they had four children:- Georgeanna, Charles, Eric, and John J. Charles got into financial difficulties and was bankrupted in 1871. Nothing is known of him after that date, he just disappears off the scene. Jessie was found dead at her home on 18th May 1880. Cause of death “…an overdose of alcohol”. Her four children then went to live with George Forsyth. At the 1881 census their ages were:- Georgeanna, 13 yrs; Charles, 11 yrs; Eric, 10 yrs; and John J., 9 yrs. Mrs Janet Jessiman died 6th July 1871, aged 56. Cause of death, “…carcinoma of breast and uterus”. George Forsyth Jessiman died 18th December 1896, aged 85. Cause of death, “…bronchio pneumonia”. “Another Marriage Party. John Kinclaven, a middle-aged man, was brought up charged with being found drunk in Perth Road on Friday morning. John seemed to regard the whole thing as a good joke. He said he was working with Mr Jessiman, who was married yesterday. He was at the party, and was sober enough when he left, but the drink took his head after he got out into the air. The Bailie: You were at the merrymaking? Accused: I do not mind where I went. The Bailie: Were you drunk ? Accused: Of course, I must have been drunk when I do not mind where I was. “THE Subscriber begs to intimate that he has RETIRED from the Business of TIMBER MERCHANT carried on by him for upwards of Forty Years at SEAGATE and DOCK STREET SAWMILLS, Dundee, and that he has made over the same to his Son JOHN, who has been his Assistant for the past Fifteen Years, and who will carry on the Business in all its Branches heretofore, in his own name and for his own behoof; and while warmly recommending his Successor to the favourable notice of his Friends and Business connections, he takes the opportunity of Thanking them for their kind Support in the past. 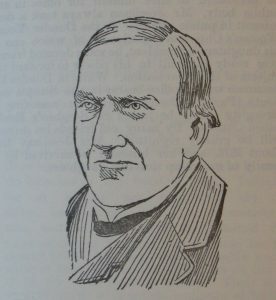 GEORGE JESSIMAN. Unfortunately, under his son John’s stewardship the business soon began to suffer difficulties, and by 1891 was in breach of its banking covenants (i.e. exceeding a £6,300 unsecured overdraft (nominal value at 2018: Relative to income – £5,040,000)). A meeting of creditors was called and on 25th January 1892 and they agreed to a composition of 5s 6d per £ (27p in the £). A composition with creditors was a mechanism whereby creditors got some of their money much quicker (and a little more) than a sequestration would provide, and the debtor avoided the stigma of bankruptcy. 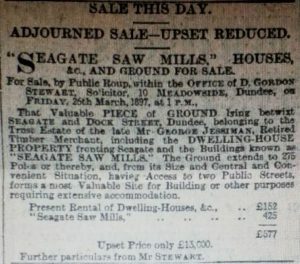 On 5th May 1892 Messrs Bell & Sime entered into a lease of the Seagate Sawmills, the whole of the works and stock being taken over by the leasees. So ended Jessiman’s, – a business that George Jessiman snr had built up over 50 years. “The death of Mr George Jessiman, wood merchant, took place on Wednesday, 16th December, at his residence, Rosebank, Broughty Ferry. The deceased was a man of many excellent parts. Born in Leuchars about 85 years ago, he crossed the Tay when a boy, his father having started business in 1813 as a timber merchant in that city. The trade was not large. Business transactions in timber with America were few; and even the Baltic ports did not export the large quantities they afterwards did. Consequently Mr Jessiman, snr., had to confine his energies for some time to home timber, coasting vessels being employed to convey the wood to Dundee. Soon, however, he discovered that the business could be greatly developed if the trade was spread, and he found opportunity to open up communications with agents in several foreign countries. When the business was making satisfactory headway Mr Jessiman, snr., died. His son, Mr George, then only 17 years of age, was left alone in the world, his nearest relative being a third cousin. Nothing daunted however, he determines to carry on the trade which his father had built up. He at once showed himself to be admirably adapted for the business he took in hand. Working early and late, he earned the confidence of brother merchants, and soon there were bright prospects of a further development of his connections. The wood-yards were situated on the south side of Seagate, the river at that time flowing past them, and allowing the vessels with their cargoes of timber to be discharged and loaded with practically no carting. Like his deceased father, Mr Jessiman had a firm belief in the advantages of a large foreign trade, and he assiduously cultivated his relationships with Russia and Sweden; and he had also the distinction of being the first merchant to import timber to this district from America. Meanwhile the large turnover enabled Mr Jessiman to make alterations on his works. Ever ready to introduce any improvement that science had devised, he decided, in 1833, to erect a sawmill in his yard for the conversion of timber; and this is certainly the first record of such a mill in Dundee, if not in Scotland. Previously the work was done by hand sawyers, and a laborious task it often was. The element of danger may have been more apparent with steam than with hand, but the employees in the establishment were not long in becoming acquainted with the modern and more rapid system of procedure. At this period Mr Jessiman found it necessary in the interests of his business to travel over large parts of the country, with the result that he became known to almost every leading timber merchant. Dundee was by then one of the seats of this trade, the harbour almost continually containing vessels with cargoes of timber for one of other of the large firms of the city. By 1854 Mr Jessiman’s transactions had so increased in number and importance that he had no alternative but to refuse many orders, or secure extended premises. To an energetic man like the deceased however, this alternative reduced itself to one course, – to carry out an extension. On the old site splendid new sawmills were erected, which were known to every Dundonian for many years. The mill was built of stone, measuring 100 feet by 60 feet, the driving shafts and pulleys being contained in the underground cellar. Amongst the machines might be mentioned combination log and deal frames, circular benches, and flooring machines. The yard extended to two acres. 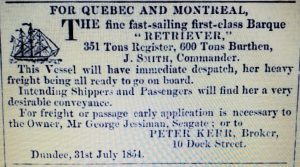 At this period Mr Jessiman was also a large shipowner, the timber for the works being nearly all carried in his own vessels. These ships traded regularly to Baltic and American ports, and were well known on the banks of the Tay. Several years after the erection of the sawmill the deceased gentleman found his efforts being curtailed by want of space and the fact that several of his machines were not exactly up-to-date. Another series of improvements was therefore begun in 1876. In the interval the character of the locality had been very materially altered. The river had been gradually driven back, streets and lanes had been opened on the south side of the works, buildings had been erected, and railways laid. A plan of reconstruction was therefore decided upon. Every inch of space was utilised, and this, combined with the additional time-saving appliances introduced, made the establishment one of the most complete of its kind in this part of the country. As a preventative against fire, an engine with two hydrants was always in a state of readiness to meet any emergency, and in the yard a huge overhead crane was placed for the handling of heavy timber. In the sheds, which covered an area of 7000 feet, every commercial wood – British and foreign – had its place, a special shed being retained for the storage of hardwood planks. About 1881 Mr Jessiman, on account of advancing years, retired from business, and the establishment in Seagate was acquired by one of his sons. The deceased, who was of an observant nature and a shrewd business man, saw many changes in the commercial life of Dundee. He was acquainted in a way with the jute trade from its infancy until it ultimately developed into the staple trade of the city. Although he could never be persuaded to offer himself for office in any public body, Mr Jessiman always took a deep interest in public affairs. To the Dundee Young Women’s Christian Association, of which one of his daughters is President, he was a devoted friend, ever ready to do all in his power to forward the objects of the organisation. Personal estate of George Jessiman (this does not include the value of real property i.e. houses, premises, and land.) He left a total of £4341 (nominal value at 2018: Relative to income – £3,472,800). £200 to his son George “…in such sums and at such periods and on such conditions as my trustees shall determine” (nominal value at 2018: Relative to income – £160,000), together with an annuity of £52 per annum “…incapable of being anticipated” (nominal value at 2018: Relative to income – £41,600). Not exactly ringing endorsements of his son’s money management skills ! £2000 to be invested by executors and the proceeds (minus any expenses) applied to the “…support and clothing and comfortable maintenance of my son Thomas during all the days of his lifetime after my decease” (nominal value at 2018: Relative to income – £1,600,000). The trustees were also to have “…full and unlimited discretion to encroach on the said capital sum …for the purpose of increasing the comforts or supplying the necessities of my said son and for defraying the funeral expenses of my said son”. Any portion of the capital sum unused was “…to form part of the residue of my estate”. This provision would seem to indicate that Thomas was “legally incompetent”, – incapable of managing his own affairs. As he did not appear on the family census returns, it is likely that he was institutionalised. To his son John, who had presided over the demise of his life’s work, he left nothing. Old Parish Registers. Births. 445/10 315 Leuchars, p.315 Scotlands People website ("Jessamine"(sic) George Forsyth). Old Parish Registers. Dundee. Marriages. 282/220 321 20th November 1837. ScotlandsPeople website. Old Parish Registers. Dundee. Births. 282/180 p190 9th August 1838. ScotlandsPeople website. Old Parish Registers. Dundee. Births. 282/180 p284 17th November 1839. ScotlandsPeople website. Old Parish Registers.Dundee. Births. 282/190 p43 2nd August 1841. ScotlandsPeople website. Old Parish Registers.Dundee. Deaths. 282/4 p159 18th May 1880. ScotlandsPeople website. Old Parish Registers. Dundee. Births. 282/190 p129 24th March 1843. ScotlandsPeople website. Old Parish Registers. Dundee. Births. 282/190 p205 19th December 1844. ScotlandsPeople website. Old Parish Registers. Dundee. Deaths. 282/1 p1139. 1860. ScotlandsPeople website. Old Parish Registers. Dundee. Births. 282/190 p264 28th July 1846. ScotlandsPeople website. Old Parish Registers. Dundee. Deaths. 282/1 p1139 16th April 1849. ScotlandsPeople website. Old Parish Registers. Dundee. Births. 282/190 p332 7th August 1848. ScotlandsPeople website. Old Parish Registers. Dundee. Births. 282/200 p39 28th February 1851. ScotlandsPeople website. Dundee Courier Thursday 17th December 1896 p.4. Statutory Registers. Dundee. Deaths. 310/151 16th December 1896. ScotlandsPeople website. Dundee Courier Monday 21st December 1896 p.4. Dundee Year Book Facts and Figures of 1896 p.81/8. Old Parish Registers. Leuchars. Births. 445/10 p315 1st Nov 1813. ScotlandsPeople website. Statutory Registers. Dundee. Marriages. 282/1 144 19th March 1867. ScotlandsPeople website. Statutory Registers. Dundee. Deaths. 282/4 579 18th May 1880. ScotlandsPeople website. 1881 Census Scotland (LDS) FHL Film 0203485 GRO Ref Volume 282-4 Enum Dist 1 p. 21. Statutory Registers. Dundee. Deaths. 282/4 455 6th July 1871. ScotlandsPeople website. Dundee Courier and Argus Thursday 1st January 1863 no page number. Dundee Courier and Argus, Tuesday 11th May May 1880 no page number. 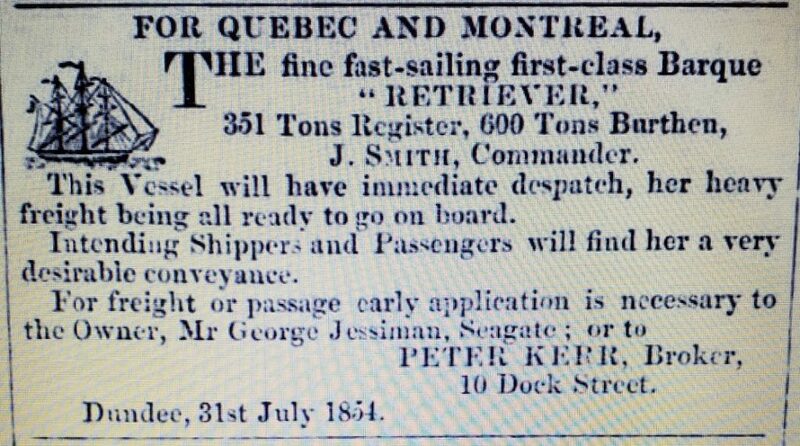 London Daily News, Wednesday 12th May 1880 p.1. Northern Warder and Bi-Weekly Courier and Argus, 18th May 1880 no page number. Dundee Courier & Argus Saturday, 17th January 1880 p.1. Dundee Advertiser, 2nd December 1892. Dundee Courier, Monday 25th January 1892 no page number. Dundee Courier, Friday 6th May 1892 no page number. Dundee Advertiser Tuesday 22nd December 1896 p.3. Wills and Testaments. 1897. SC45/31/49 Dundee Sheriff Court image 166. ScotlandsPeople website. Dundee Courier, Tuesday 23rd February 1897. Dundee Courier, Friday 26th March 1897. Wills and Testaments. 1897. SC45/31/49 Dundee Sheriff Court image 168/9. ScotlandsPeople website. Thanks to all the helpful staff in Local History section. The information above about George Forsyth Jessiman has been collated from a range of digital and hard copy sources. To the best of our knowledge it is correct but if you are relying on any information from our website for the purpose of your own research we would advise you to follow up the sources to your own satisfaction. If you are aware of an inaccuracy in our text please do not hesitate to notify us through our Contact page.